The earthworks remains of a substantial Pictish promontory fort established in the Iron Age (or possibly earlier) but extensively rebuilt in the early fifth century AD. The site (particularly the outer defences) has been partially destroyed but the central ramparts still survives to a good height and a chambered well can also be seen. The site has a visitor centre. Notes: The fort is sign-posted and relatively straight-forward to find. There is a car park in the fort itself but on-road parking is also possible. The well is found off King’s Street (sign-posted). Originally an Iron Age (or earlier) fortified settlement, Burghead Pictish Fort was substantially rebuilt in the early fifth century AD into the largest promontory fort in Scotland. Consisting of an upper and lower enclosure it may have been the primary settlement of the Kingdom of Fortriu. It was destroyed by Viking in the Ninth Century. Burghead stands on a promontory of land overlooking a sheltered bay that has hosted a defended settlement since the Iron Age and possibly long before. By the fifth century it formed part of the Kingdom of the Fortriu (as did nearby Dunnottar), whose territory occupied the coast of the Moray Firth, and was even possibly their capital. Certainly at this time the site was extensively rebuilt into one of the largest promontory forts in Scotland enclosing over seven acres. It was divided into two sections - a higher upper enclosure, mooted to have been a Royal or religious space, and a lower area that contained the settlement. Each was protected by a substantial rampart consisting of a rubble core held in place with layers of oak logs, set a little under one metre apart, and revetted with standstone. A timber breastwork of some description would have topped the structure creating an overall obstacle around 8 metres wide and 6 metres tall; a very effective barrier and, given the huge resource to construct such a structure, a clear statement as to the wealth and power of the settlement. 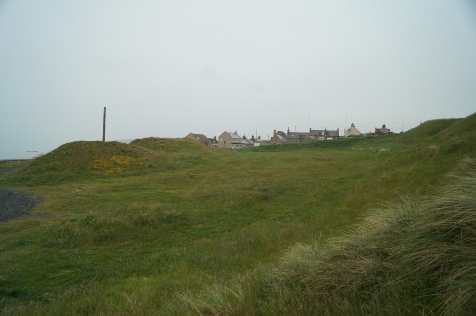 These impressive defences were further enhanced by an elaborate, multi-rampart and ditch outer defensive work making Burghead a rare example of a multivallate promontory fort. Of note both upper and lower compounds had separate entrances again indicating a clear status divide between the two areas. The discovery of fragments of decorated stones dating from the ninth century AD and believed to be from church crosses, suggest that by this time the site had assumed some sort of religious (Christian) function. Even if true the use of the site seemed to come to an abrupt end soon after at the hands of the Vikings. The Annals of Ulster record a Viking victory over the Northern Picts in AD 839, including the burning of two major settlements, which some authors suggest included Burghead. Even if this wasn't the case, the site was captured by Sigurd 'the Powerful', Earl of Orkney in AD 884 for its easy access to the North Sea, existing defences and the sheltered bay made it an ideal base from which to launch the conquest of Moray. A detailed plan of the site was made in 1793 by General William Roy. This informs much of our knowledge of the fort as, in the early nineteenth century, the outer defences were levelled to make way for housing whilst much of the stonework was robbed to rebuild Burghead harbour. Today only the inner rampart stands to a significant height and lacks of any of the masonry that would have so awed fifth century visitors. 1. 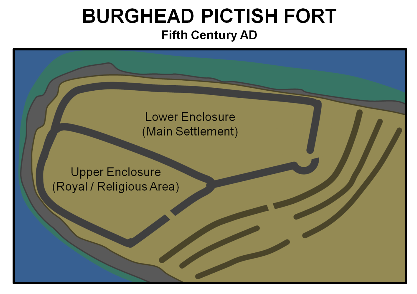 It was the Vikings who gave the site its current name - they called it Burghe - which subsequently became Burghead. 2. A number of bull stones, beautiful carvings of this symbolic creature of strength to the Picts, were found at Burghead during the partial demolition of the site in the nineteenth century. Only the whereabouts of six are now known but all of these are in museums with two on display in the visitor centre.